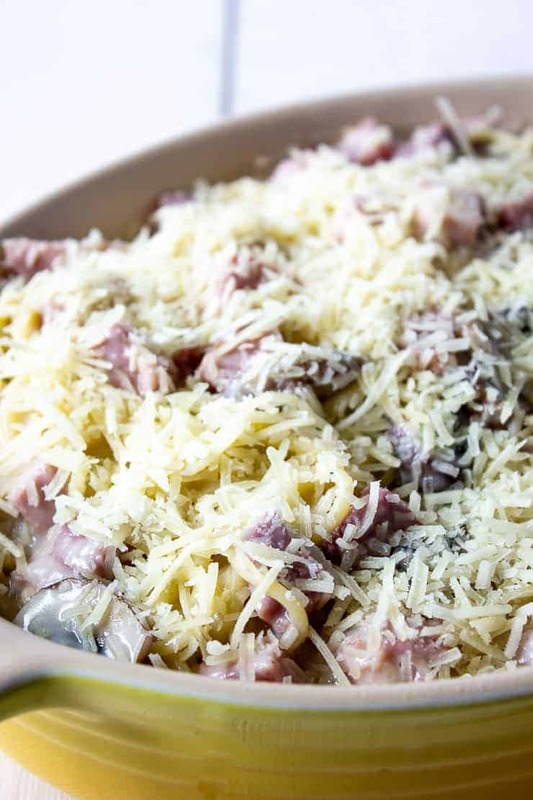 Delicious Ham Tetrazzini is a scrumptious twist on a classic. You’ve heard of chicken tetrazzini, right? Well this is ham tetrazzini. I’ve used ham instead of the chicken. 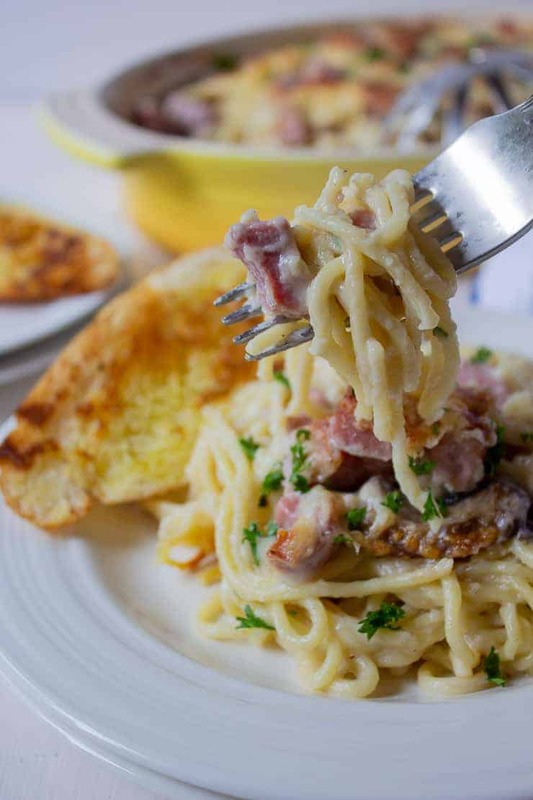 This is a perfect dish to use up leftover ham. Easter is next weekend and we will be eating a huge baked ham. I’m certain there will be leftovers and I’m already planning my week with leftover ham recipes. We will be eating this delicious tetrazzini again! Also on the weekly menu will be baked ham and cheese sandwiches and ham and cheese biscuits. I wonder if I’m going to need a bigger ham! 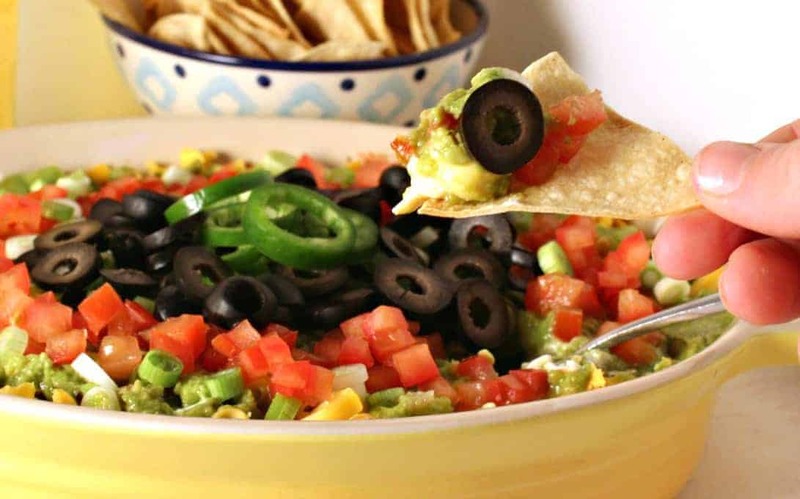 It’s okay to actually plan for leftovers especially when it’s this delicious. 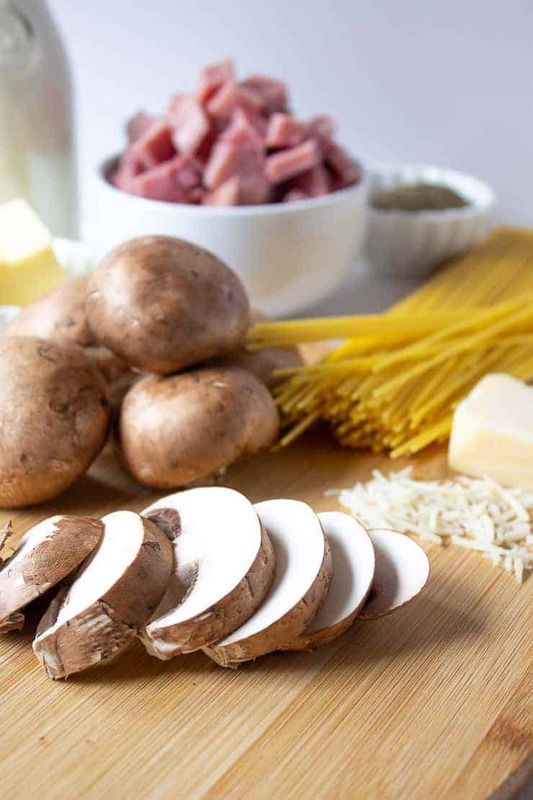 What ingredients are needed for Ham Tetrazzini ? Could I add additional vegetables to this dish? You bet. 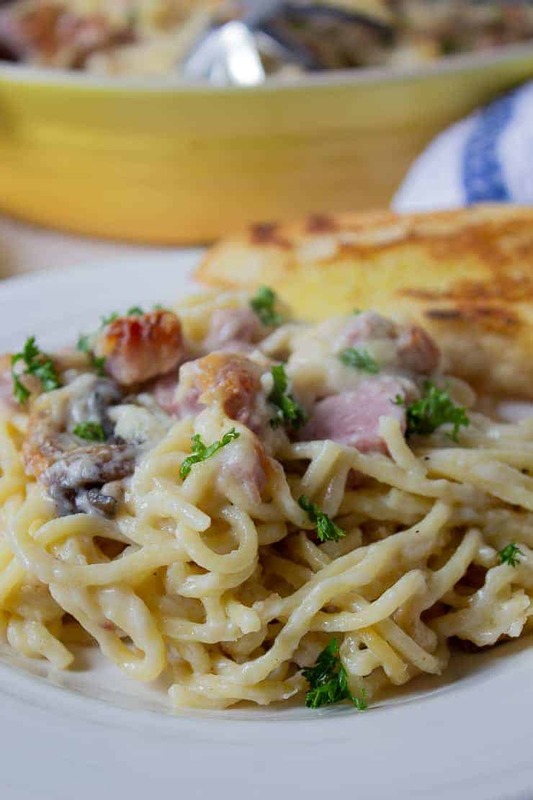 This tetrazzini would be delicious with peas or asparagus. For the peas, just add a cup of frozen peas right into the mixture when you add the mushrooms and ham. If adding asparagus, use steamed asparagus and cut into small pieces. Gently fold the asparagus into the creamy mixture. How do I make Ham Tetrazzini? How do I make a roux? 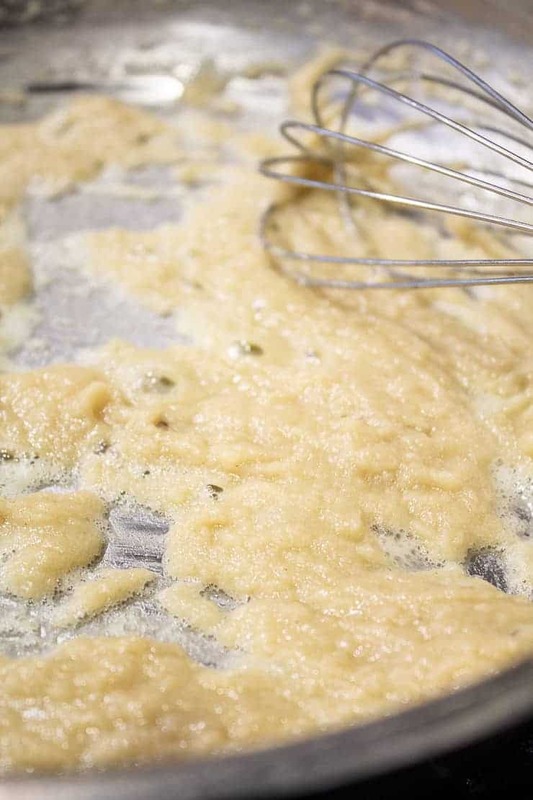 A roux is a butter and flour mixture that is used to thicken the sauce. To make the roux, melt butter in a pan. Stir in flour. Let mixture cook for 2-3 minutes over low heat. This helps remove any raw flour taste. 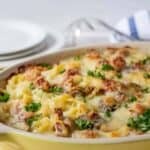 Can I make this ham casserole ahead of time? Yes, this can be made ahead of time. Follow recipe as directed. Add to a casserole dish. Allow dish to cool and then cover with plastic wrap and refrigerate. 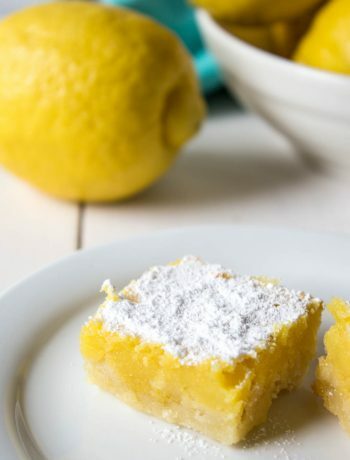 Remove from refrigerator at least 15 minutes prior to baking. Remove plastic wrap and bake as directed, increasing baking time by 15 minutes. Use a hearty spaghetti. I used regular spaghetti noodles, not thin spaghetti or angel hair pasta. You could also use fettuccine noodles. Don’t add salt until after you’ve added all the other ingredients. Some chicken stocks already have salt and the ham may is salty too. You might not need to add any salt at all. When sauteing mushrooms, allow the mushrooms to brown. This browning adds extra flavor. After sauteing the mushrooms, use the same pan for making the roux. Do not wipe pan out before making the roux. Just whisk all those brown bits right into your roux. Be certain to spray your casserole dish prior to using. You don’t want anything to stick. If your casserole dish is really full, place dish on a baking sheet before putting in the oven. If your casserole oozes over, the baking sheet will catch all the drips making cleanup easier. 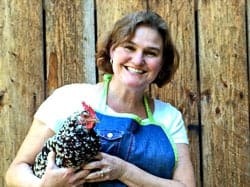 If you haven’t planned your Easter meal yet, check out this Easter Recipe collection. It has everything you need from breakfast to dessert! Cook Spaghetti noodles according to package directions. Drain and set aside. Add 2 tablespoons butter to a saute pan. Add mushrooms. Cook until browned. Remove from pan. Do not wipe or rinse pan. With same pan add 4 more tablespoons butter. When melted, add flour. Stir over medium low heat for 2-3 minutes. Slowly add milk while whisking flour mixture. Continue whisking until mixture begins to thicken. Add chicken stock and combine. Add nutmeg, thyme and pepper. Continue cooking over medium heat until mixture is heated through. Stir in sherry (if using) and add mushrooms and ham. Taste mixture. Add salt if needed. Combine mixture with spaghetti noodles and then place into a lightly greased casserole dish. Bake in a preheated 400 degree oven for 25-30 minutes until mixture is bubbly and top is golden. White wine can be used in place of the sherry wine or it can be omitted altogether. To make ahead of time follow directions through placing in casserole dish. Allow to cool, then cover and refrigerate. When ready to bake, remove from the fridge at least 15 minutes prior to baking. Remove cover. Bake as directed adding up to 15 minutes of additional baking time. May add frozen green peas or cut steam asparagus to dish prior to baking, if desired. Homemade Garlic Croutons Homemade "Miracle Whip Dressing"
What a great idea to use up leftover ham! I still have plenty in the freezer! I will be making this soon 🙂 Sounds so delicious! 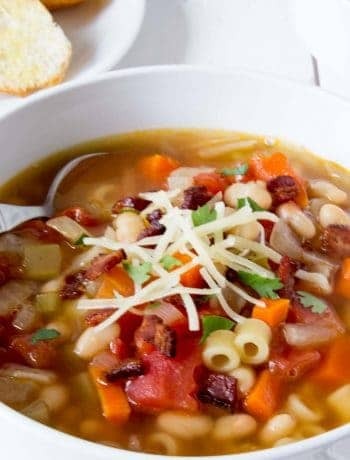 This is total comfort food! I love the addition of sherry wine or white wine, great compliment. 🙂 Take care. 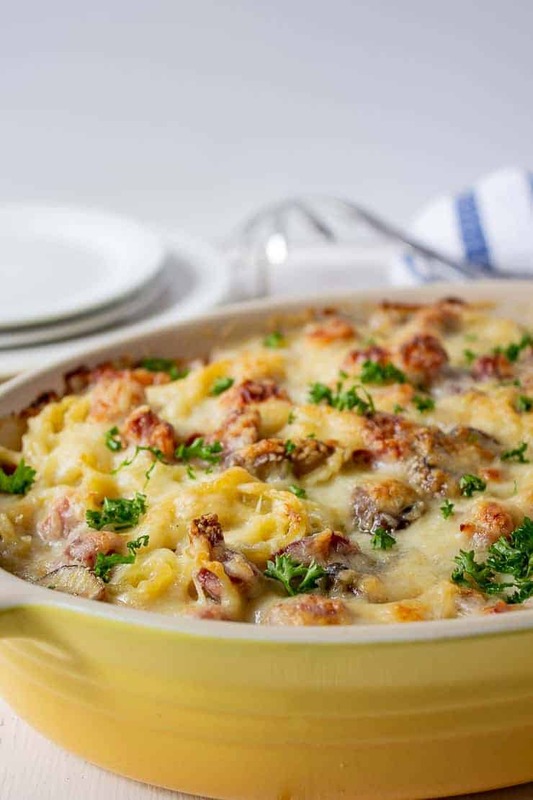 Tetrazzini always reminds me of a line from one of my favorite movies…Cousins. I need to make this!! It sounds and looks delicious!! What a great idea Kathy! We would LOVE this! Always looking for new ways to use up the holiday ham! Finding a variety of recipes to use up leftovers is always a challenge. This is a winner in our house. I’ve actually made a turkey tetrazzini after Thanksgiving (a number of years ago), but I’ve never thought about mixing it up and using ham. This is perfect! Laura and I were just talking this morning about getting a ham this week…mainly for delicious ham sammiches. 🙂 But I might have to steal some of that ham to make this tetrazzini. It looks delicious!! Thanks, David! Planning for the leftovers is half the fun!